Heroes are often defined as ordinary characters who get pushed into extraordinary circumstances, and through courage and a dash of luck, cement their place in history. Chosen as FDR's fourth-term vice president for his well-praised work ethic, good judgment, and lack of enemies, Harry S. Truman was the prototypical ordinary man. That is, until he was shockingly thrust in over his head after FDR's sudden death. The first four months of Truman's administration saw the founding of the United Nations, the fall of Berlin, victory at Okinawa, firebombings in Tokyo, the first atomic explosion, the Nazi surrender, the liberation of concentration camps, the mass starvation in Europe, the Potsdam Conference, the controversial decision to bomb Hiroshima and Nagasaki, the surrender of imperial Japan, and finally, the end of World War II and the rise of the Cold War. No other president had ever faced so much in such a short period of time. 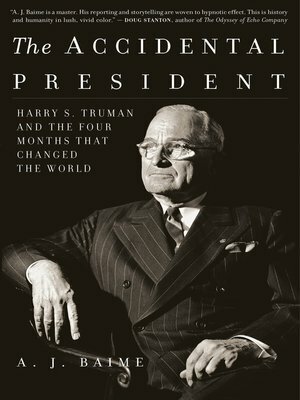 The Accidental President escorts readers into the situation room with Truman during a tumultuous, history-making 120 days, when the stakes were high and the challenges even higher. A. J. BAIME is the New York Times best-selling author of The Arsenal of Democracy and Go Like Hell. Both books are in development for major motion pictures. Baime is a longtime regular contributor to the Wall Street Journal.